The weather is getting warmer and that means it’s time for summer foods! Hooray! With Soulkey pulling off a miraculous win against INnoVation, it’s time to crown another Zerg GSL Champion and time for another Zerg recipe! More eSports events need people in monkey costumes. 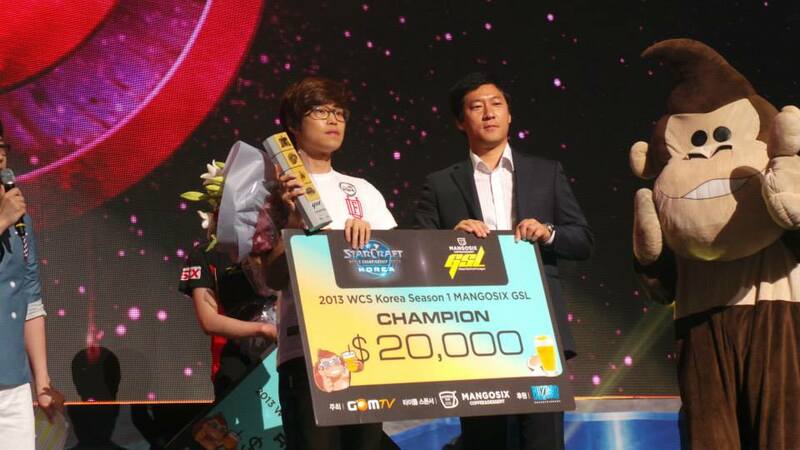 If Soulkey’s plays have inspired you to hop onto ladder, I suggest that you do not ladder on an empty stomach! 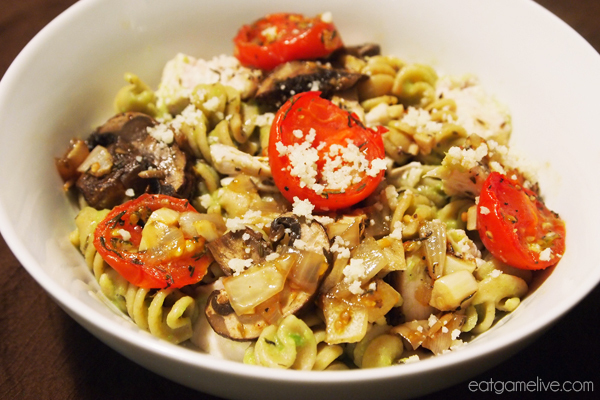 So if you’re looking for a meal that will satisfy your hunger during the heat, try out this recipe: Fungaled Fusilli! It’s green and lean! Fungal Growth has never been this delicious… The avocados in this dish provide a healthier alternative to standard creamy pasta sauces. In this application, I’m using the avocado sauce for cold pasta salad. There is no need to be scared of this fungal growth, because it won’t root your army or ruin your drop play. How could you say no to roasted veggies? This dish is best served at room temperature or slightly chilled. Prep time will be about 35 minutes. Cook time is about 40 minutes. This recipe will make 4 servings. Preheat your oven to 375° (~190° C). Place chicken in a baking dish. Season with salt, pepper, and thyme. Drizzle 1 table spoon of olive oil over the chicken. 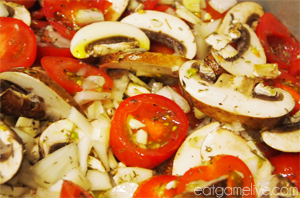 Place your tomatoes, garlic, mushrooms and onions in a separate baking dish. Season with salt, pepper, and thyme. Drizzle 1 tablespoon of olive oil over the vegetables. Roast the chicken for about 25 minutes and remove from oven. Roast vegetables for 40 minutes. Allow chicken to cool. Once the chicken has cooled, chop into cubes. When vegetables have finished cooking, remove them from the pan. Allow them to cool. Add pasta into salted boiling water. Cook until pasta is done. Reserve a ladle full of pasta water and strain pasta under cold water. Return the pasta to the pot. Slice your avocado in half and remove the pit. Carefully scoop out the meat and place it into a bowl. Using a fork, smash and separate the avocado. Smash avocado until smooth. Add in parmesan cheese, lemon juice, salt, pepper, and thyme. Add in the reserved pasta water. Stir to combine. 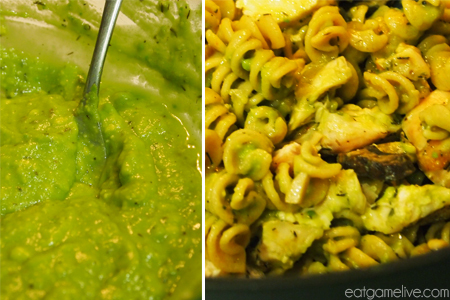 Pour avocado sauce over the pasta and mix. Add in your chopped chicken and roasted vegetables. 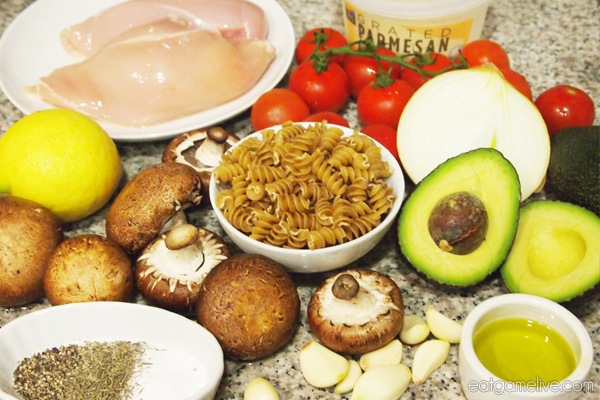 Gently stir the chicken and vegetables through the pasta. (Optional): top with extra cheese. You can eat this dish warm, but I personally prefer eating it cold. I think the avocado flavor is more noticeable when chilled. No matter which way you prefer it, this dish is definitely worth a GG WP. Serve it at your next home LAN party or home barcraft! FEED THE SWARM!